When you have a few minutes today, there's a little boy that could use your prayers and a complete healing from God. His name is Jonah and he was born with a rare genetic skin disorder called EB and this little boy is fighting for his life. You can visit his mom's blog to check on updates on him - they would so appreciate your prayers on his behalf. 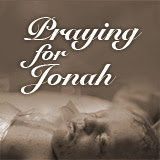 i will pray for jonah. i am sure you dont know this - how could you - but my dh is one of the original owners of Nuskin. They sponser the research for EB - at stanford I think? they are getting closer to a cure every day, hopefully soon enough for baby jonah. Thanks for sharing this, Jolanthe! I saw it last night and posted about it on my blog as well. So sad.